Hey, everyone! I don't know if the kids are back to school where you live, but around here, they will be headed back (for the most part) on Monday. I don't remember how I felt about the end of summer as a kid, other than I do remember that it meant a lot less time to buy packs of cards and trade with my buddies. Well, we aren't slowing down at the Circus. We have another pack to go and a lot more before the end of the baseball season! Before I get going, though, I wanted to updated everyone: I am a draft (or two) behind. We will have a draft this coming weekend and I hope to do another double-draft next week. Managers, I will send this week's list on Monday evening. 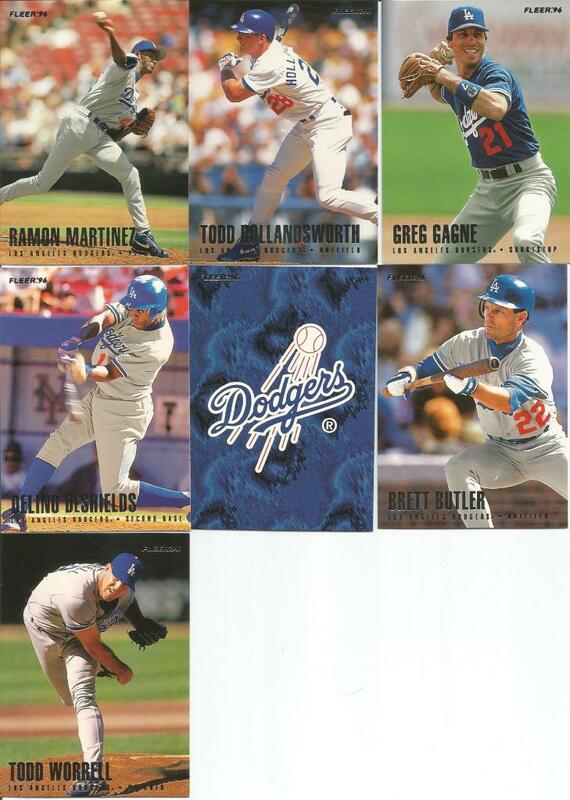 Here we go with today's pack: 1996 Fleer Dodgers. Man, I though we were going hit another Perfect Pack. Alas, it was not meant to be. * However, several of you snagged cards here, plus we get to add a few free agents to the upcoming draft pool - not shabby at all. *My attempt at a nod to Mitch Hedberg.